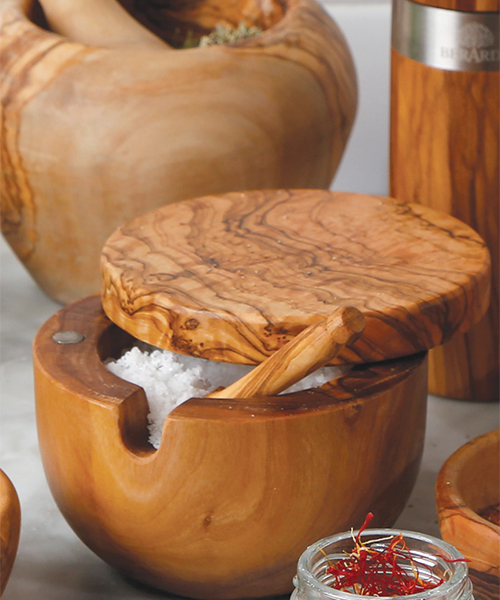 Handmade and masterfully turned by European woodworkers, this stunningly grained olive wood vessel is an indispensable piece in the kitchen. With its clever swivel top and scoop, place it within easy reach for all your cooking needs...it comes with a bag of our favorite KATZ French fleur de sel! Keeper includes 6 oz of our Fleur de Sel de Guerande, and an olive wood salt scoop.